Description: CSXT 7899 & EMDX 7005 are seen on Q386 at Cumberland, MD. 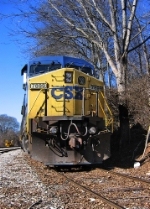 Description: CSXT 7899 is seen on Q386 at Cumberland, MD. Description: CSX lite power heading towards South Kearny yard. Title: S/B onto the NS at Butler St. Title: CSX train 680 heads'm towards CSX Boyles Yard. Description: The first train of the day is X439 consisting entirely of loaded trash containers. Pretty soon it will stop at CP5 for an hour blocking Mt. Vernon street crossing and stinking up the town. Description: Believe it or not, this area was under a tornado alert when I snapped this photo! A loaded auto-rack sprints southbound over the Oostanaula River at Resaca. This is the south end of the Resaca passing siding. Description: On the way to Point Of Rocks from Germantown, stoped to lense the station w/CSX freight breaking the silence of this remote location. Description: On the Old Main under the South Street bridge. Description: Crawling along the Old Main. Realignment of the track is scheduled for tomorrow. Description: A mixed merchandise pulls to a stop to wait for a signal to proceed into Baltimore. Description: After receiving permission to proceed, a mixed mercahndise on the Old Main heads toward Baltimore. Description: A mixed merchandise passes the new track into which the Old Main will be tied to tomorrow. Description: The tracks may be new, but there's still a bit of a dip in the new alignment where the new concrete sleepers meet the 30+ year old wooden sleepers. Description: Jamming out with the band "Subway", while eastbound tonnage rumbles by in Talcott. Description: The 7899 leads a grain train through Bell Witch country at Adams. 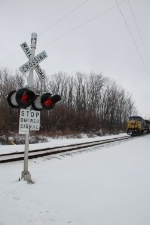 Description: CP train #888 passes by the former CK Tower site in Winona - This was the first train of the day. Description: The rusty and faded builders plate of CSX C40-8W 7899 serial number 47267 built in April of 1993, i guess these things are older than we normally consider them to be. Description: A widecab GE sits parked on the leaf covered light rails of the Athens yard track on a beutiful January Sunday. Description: a eastbound empty auto rack train rolls through Durand.